Shrub or subshrub 30 cm to 2 m tall Leaves: alternate, often borne near ends of stems on a usually hairless stalk 1.5 - 25 cm long, with three leaflets (trifoliate). Flowers: borne on unbranched or few-branched small clusters in leaf axils, each cluster usually having fewer than 25 flowers. Fruit: fleshy with a center stone (drupe), densely clustered, erect, stalkless or nearly so, cream to yellowish, 4 - 7 mm thick, spherical, hairless, sometimes persisting through winter. Leaflets: stalked (middle leaflet stalk longest), 3 - 15 cm long, 2 - 11 cm wide, broadly egg-shaped or almost four-sided to nearly circular with a rounded to nearly squared base and a pointed tip, unevenly toothed or wavy, hairless on both surfaces or with appressed hairs beneath and a tiny line of curly hairs on the midvein's upper surface. Fall color is yellow to orange, rarely bronze to red. Form: mostly upright, single-stalked or few-branched, forming colonies by runners but lacking aerial roots. 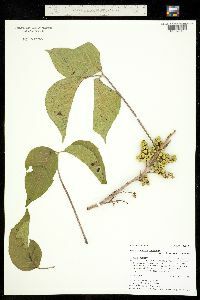 Similar species: Toxicodendron radicans is a vine or shrub with aerial roots, narrower leaflets, and an open cluster of fruit hainging downward. 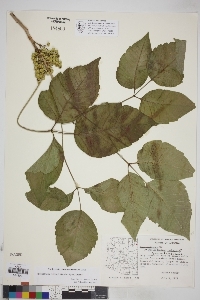 The hybrid between Toxicodendron radicans ssp. 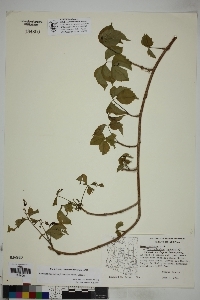 negundo and Toxicodendron rydbergii is intermediate in characteristics, and can be distinguished from T. rydbergii because it sometimes grows as a vine or has aerial roots, occasionally has somewhat hairy leafstalks, and has narrower leaflets. 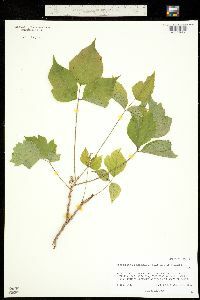 A few tree and shrub species may be mistaken for T. rydbergii. 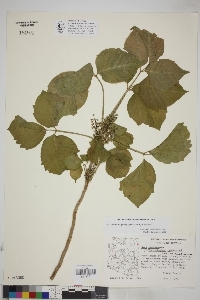 Acer negundo and Staphylea trifolia have opposite leaf arrangements. 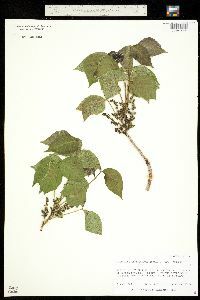 Ptelea trifoliata has alternate leaves, but the leaflets are all very short-stalked with non-toothed to finely toothed margins. Habitat and ecology: A northern and western species found scattered in fields, woods, dunes, and open, sunny areas. Etymology: Toxicodendron means "poison tree." 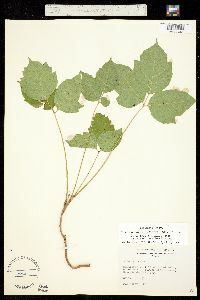 Rydbergii is named after Per Axel Rydberg, an early 20th century member of the New York Botanic Garden and expert on the flora of the western United States. 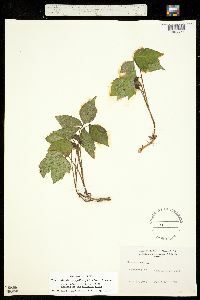 Common Name: western poison ivy Duration: Perennial Nativity: Native Lifeform: Shrub Wetland Status: FACU General: Shrub or subshrub 30 cm to 3 m tall; stems erect, single-stalked or few-branched, glabrous, forming colonies by runners but lacking aerial roots. 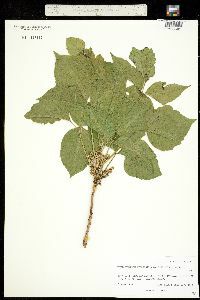 Leaves: Alternate, often borne near ends of stems, 1.5 - 25 cm long, trifoliate; leaflets stalked, the middle leaflet stalk longest, the middle of stalks red, leaflets 3 - 15 cm long, 2 - 11 cm wide, broadly obovate, apex acute; margins unevenly dentate to crenate, glarous on both surfaces or with appressed hairs beneath and a tiny line of curly hairs on the midvein's upper surface; fall color is yellow to orange, rarely bronze to red. Flowers: Infloresence a axillary, short, narrow panicle; flowers to 3 mm long, sepals deltoid, greenish, glabrate; petals oblanceolate, cream to yellowish with dark veins . Fruits: Globose drupes to 5 mm in diameter, cream, striate, glabrous. 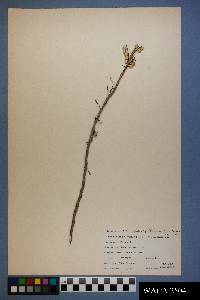 Ecology: Found in moist but often sunny sites in canyons and at seeps and springs, from the low deserts to mixed conifer forests; 1500-8500 ft (455-2575 m); flowering May to June. Distribution: Across s CAN and n US (e of the Cascades), s through Rocky Mountains and Great Plains to AZ, NM, and w TX. Ethnobotany: unknown Synonyms: None Editor: FSCoburn 2014 Etymology: Derived from the latin toxicum, -poison" and the Greek dendron, -tree". 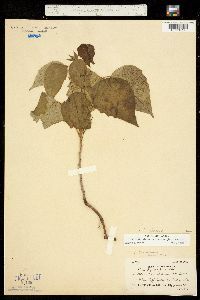 Rydbergii is named for Per Axel Rydberg (1860-1931), curator of the New York Botanical Garden Herbarium who desrcribed hundreds of species and wrote multiple floras of regions in N. America. Vigorously rhizomatous and colonial, suberect, simple or sparingly branched shrub to 1(-3) m; lvs tending to be approximate toward the top of the stem; petioles elongate, glabrous; lfls broadly ovate to suborbicular, tending to be openly folded along the midrib rather than flat, glabrous on both sides, or strigose beneath and often with a line of minute, curly hairs along the midrib above; infl unbranched (racemose) or sparingly branched, usually with fewer than 25 fls; frs 4-7 mm thick, smooth, sessile or subsessile and crowded in a ±erect infl; otherwise much like no. 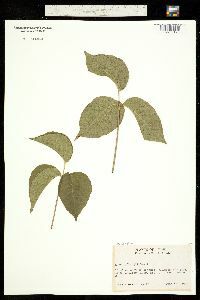 4 [Toxicodendron radicans (L.) Kuntze], with which it intergrades to some extent; 2n=30. Open, sunny habitats; widespread in w. U.S., extending e. in n. U.S. (especially north of the 42nd parallel) and s. Can. to N.S. and N.Y., thence s. at upper elev. to Va. and W.Va.